In 2006, CDC officials directed doctors to give all pregnant women a flu shot and, in 2011, a Tdap shot during every pregnancy, no matter how little time has elapsed between pregnancies. 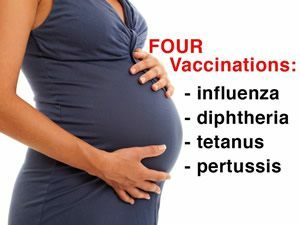 Prior to FDA licensure, influenza, diphtheria, tetanus and pertussis vaccines were not tested in or proven safe and effective for pregnant women in large clinical trials when given during every pregnancy either singly or simultaneously. Categorized by FDA as Pregnancy Category B and C biologicals because it is not known whether the vaccines are genotoxic and can cause fetal harm or can affect maternal fertility and reproduction, administering influenza and Tdap vaccines to pregnant women is an off-label use of these vaccines. It is a policy that assumes maternal vaccination is necessary, safe and effective without proving it.